When considering hiring someone to care for your trees, we strongly recommend hiring an ISA Certified Arborist. Being certified indicates that the arborist has a solid knowledge of tree care and is committed to staying current in the profession. Pruning- Deciduous trees have a pruning cycle, some should be pruned every year, some every 2-3 and some every 3-5 years. We use proper pruning cuts so that the tree can seal-over properly. In order to prune a tree properly it often requires climbing; we use arborist ropes and saddles, and all safety precautions, in order to thoroughly prune the tree. High Reach Equipment- With the use of a bucket truck our tree crews can provide safe/efficient services for our clients. training and an artistic eye! Tree Removals- Removals are sometimes necessary. We might use rigging techniques to bring down the tree piece by piece, or we will just pull the tree over if there is room and it’s safe to do so. When considering removing a large tree, safety is critical. We ensure the safety of human and physical assets in the approach we use for removals. We haul the wood away or leave it for firewood (at the customer’s discretion). 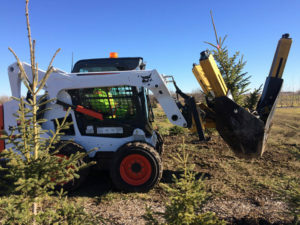 Dutch Elm Disease Prevention- When an elm has to be removed, this can be done at any time, all branches and wood have to go to the City landfill and the stump needs to be ground below grade. Elm trees need to be pruned at least every 3-4 years, this is only done when the trees are dormant from September 1st to April 1st. The branches and pruning debris need to be sent to the landfill. Hazardous/Storm Damaged Trees- That tree that is split in two in may not need to be removed! If possible, we will perform tree surgery and keep the tree around for many years. Stump Grinding- We thoroughly grind the tree stumps including all the tree’s surface roots. Stump-grinding can be a dangerous job but we take necessary precautions to minimize damage. 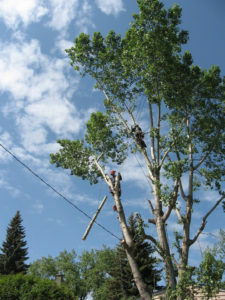 Consultations/Tree Risk Assesments– We can provide tree care consultations on a per-hour basis. As well,our ISA Certified Arborists can administer a tree risk assessment that presents tree owners and risk managers with the information to make informed decisions to enhance tree benefits, health, and longevity. BioForest Tree Injection System for Pest Control- Our new system for delivering effective pest control is the first in the province and is here to suit your needs. Our system allows us to inject the product into your trees systemically with little to no interference to the environment or beneficial insects. Treatments can last up to two years, further reducing environmental effects and lowering cost. 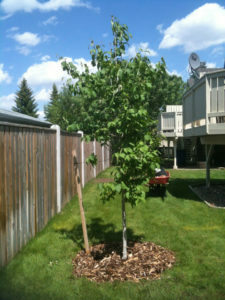 Deep-Root Fertilizing- If you’ve watched your birch tree wither away, if you have young trees and shrubs that need a boost, or if you are having trouble with the colour of your old spruce, we have the solution. We strongly recommend our custom fertilizer mix applied twice per year to keep your trees healthy, disease resistant and in good colour. We challenge you to try out our fertilizing services…we’re certain you’ll see a difference (and your trees will feel the difference)! Integrated Pest Management (IPM)- Diseases and insects can sometimes intrude on your landscape. Diagnosing the disease or insect is the first step to management. We have licensed pesticide applicators on staff to set-up an IPM program if required. When considering hiring someone to install your landscapes, we strongly recommend hiring a CNLA Certified Landscape Technician. Being certified indicates that the landscaper has a solid knowledge of landscape construction and is committed to staying current in the profession. 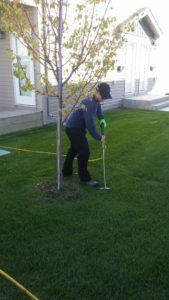 BaumaLite Tree Spade- Our new tree spade can securely transport trees up to 2″ in diameter. Did you just plant a tree but are re-thinking it’s location? 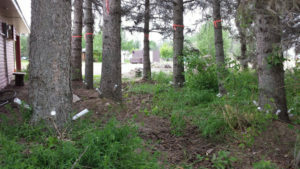 Do you have a small tree nursery and want to create a shelterbelt on your property? Give us a call and we will let you know the best option. Lot Sweeping- We use a Bobcat with a sweeper attachment, a dump truck and other tools to professionally clean your lot. We will also have a spray truck handy if we need to wet down the lots first just in case dust is a problem. Lot sweeping services provide an essential clean-up after a winter of gravel and salt. Call us soon for a quote and we will get you booked in! 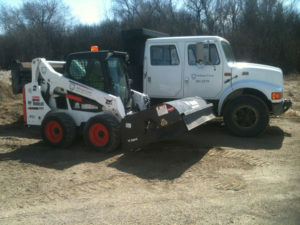 Bobcat Services- We will contract out our skid-steer and operator to help with any job big or small. Yard Renovations/New Yard Installations- Starting from scratch or just looking to make some changes? Working with you, we can make your dream yard a reality. From yard sub-grading to laying the final piece of sod we have trained professionals to do the work for you. We can expand your existing shrub beds or create new ones altogether. From concept to completion, we take pride in our services. Tree, Shrub and Shelterbelt Planting- We will help select trees that are suitable to the size, ‘yards. Our trained staff will then plant them properly according to the ISA Standards. Irrigation- We provide fall sprinkler blow-outs for our clients. As well as fixing broken sprinkler heads, we can provide an audit of the residential site (and make sure everything is working properly). Mulch Delivery and Installation– We provide economical mulch services and we can custom order and install various grades and colours of mulch to keep your yard low maintenance. Mulch a great idea for water/weed control and much more. Spring clean-ups- Give your lawn the right start in the spring with a power-raking, mowing and aerating. Gardening Services- We can help spruce up and maintain your yard. From spring clean-ups to winter preparation, we can help keep the weeds and grasses from taking over. 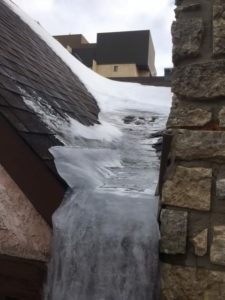 Roof Top Snow Removal- We can remove (and are insured to remove!) snow from the roof of your home. With the help of our bucket truck or just with shovels, we can remove the snow from your roof before it melts and turns to ice. We can then move the fallen snow away from the foundation of your home so there is less risk of flooded basements. Residential Snow Removal Services- For residential sites we provide snow clearing with shovels, snow blowers, sweepers and trucking/bobcat services if requested. We can do seasonal or custom contracts to suit your needs. 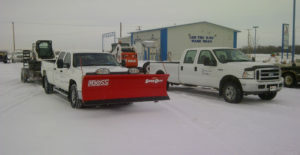 Commercial Snow Removal Services- For commercial sites we provide a Bobcat to clear the snow. We also have trucks for hauling away the snow when the piles get too large. pea gravel and salt (if requested) to provide traction on slippery ice. Christmas Lights- Working efficiently and safely with our bucket truck we can install and remove your Christmas lights and seasonal outdoor decorations. We can also store them for the off-season to avoid taking up space in your garage or basement. 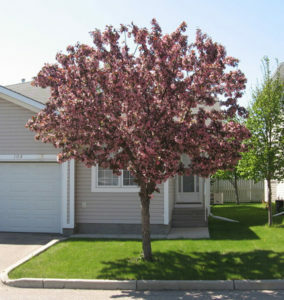 Or phone our office at 306.242.TREE(8733) for more information on any of our services.